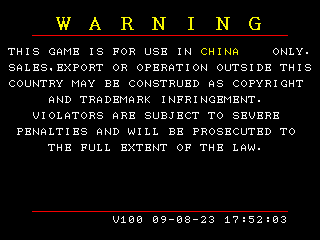 Peter and Morten dumped the internal ROM from Knights of Valour 3, the China / Taiwan / Hong Kong only installment in the series, and first game to make some significant changes to the gameplay formula. 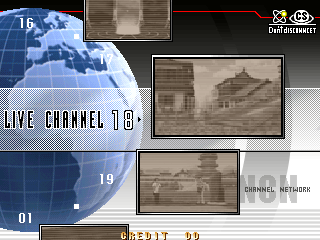 Metallic bypassed an additional check the game makes for an FPGA on the ROM board, and I fixed up a few holes in our video emulation needed to make the game look correct (it runs at a higher resolution of 512×240 pixels) There are still some slightly odd looking visuals in some stages where the bottom row of background tiles is repeated, but I think that’s because those backgrounds were originally designed to run at 224 resolution and IGS were simply hoping nobody would notice. 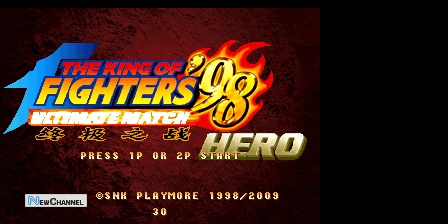 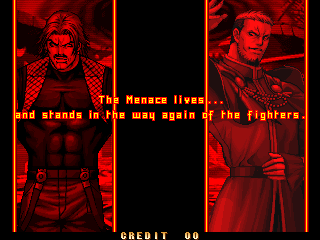 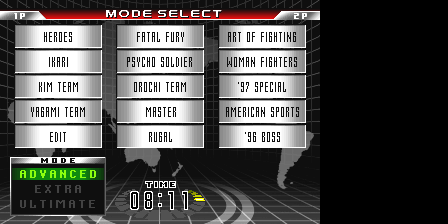 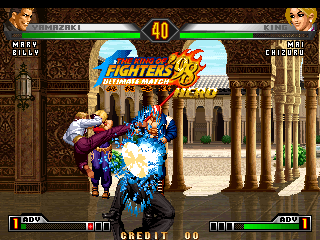 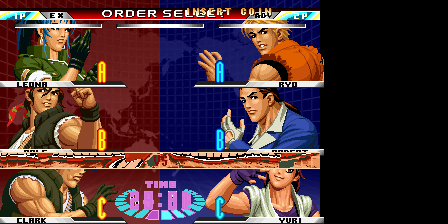 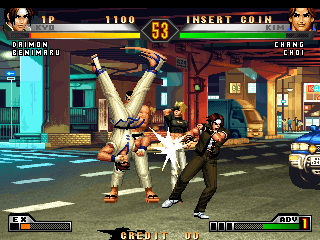 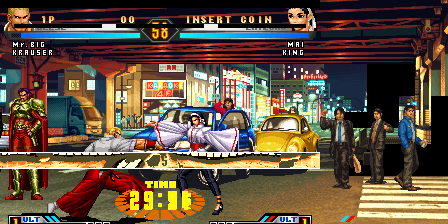 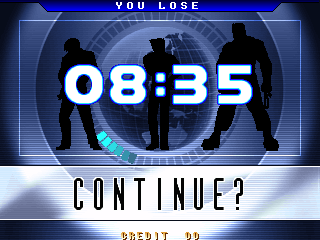 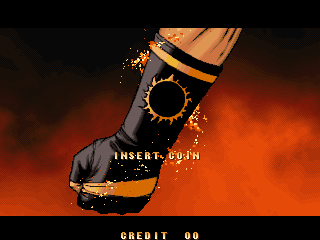 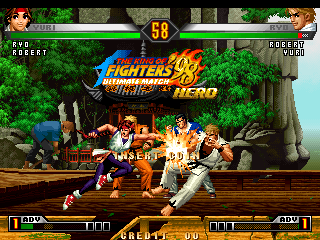 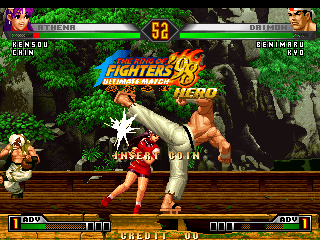 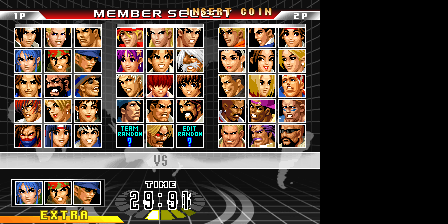 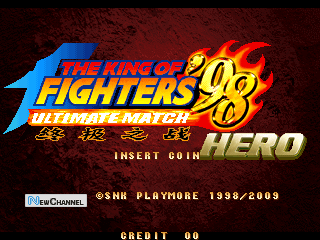 Here are the first Work in Progress shots from The King of Fighters ’98: Ultimate Match HERO after Morten Shearman Kirkegaard and Peter Wilhelmsen dumped the internal rom. 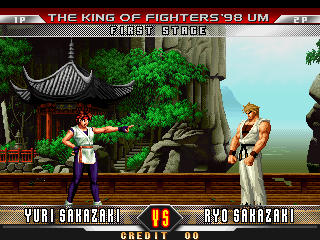 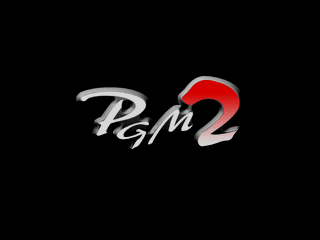 They show that the PGM2 emulation still needs work, especially with a missing sprite enable register and screen resolution control. 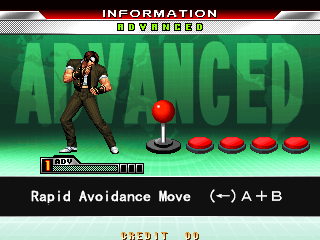 There is also no music at the moment, and a hardlock in attract mode. 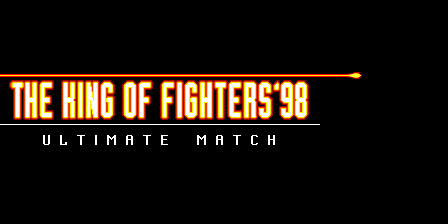 *edit* fixed various bugs, made a video. 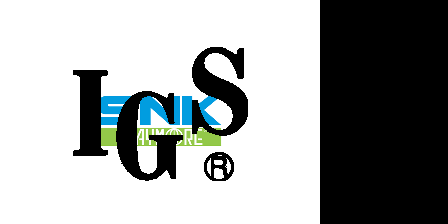 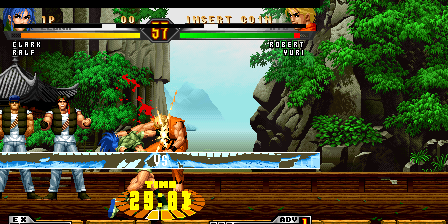 sound is still incorrect but being worked on. 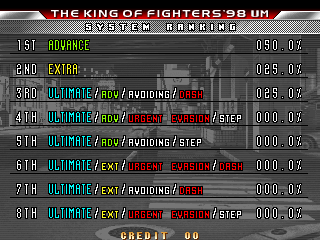 *edit* Further bug fixes to the audio, stage music doesn’t play over intro if left in attract now. 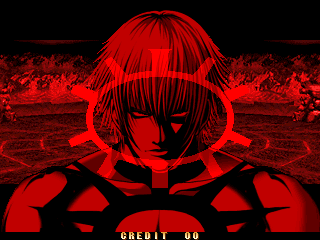 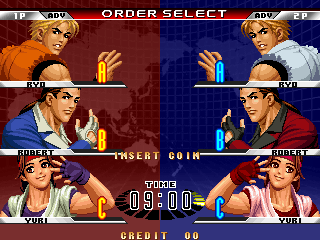 The PGM2 system allowed for use of Memory Cards (supplied by the arcade, specific to each game / region) in order to save Character progress. 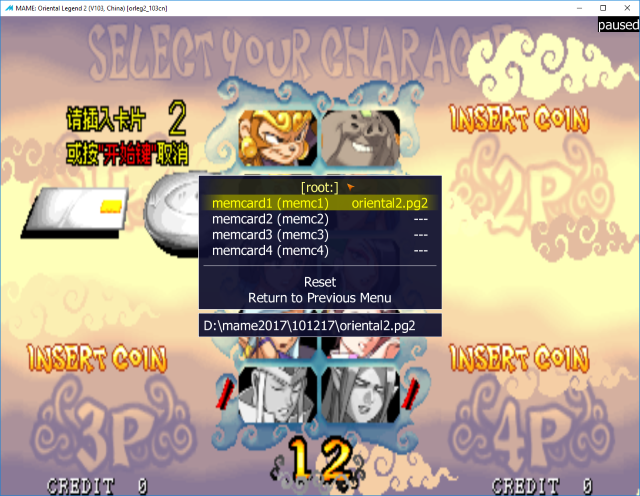 Each card allows for a limited number of saves (500?) 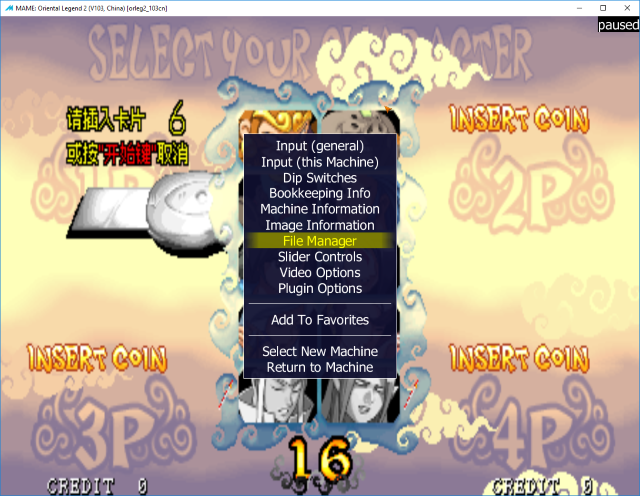 but allows you to store items, XP and money your character has acquired and reuse them between playthroughs. 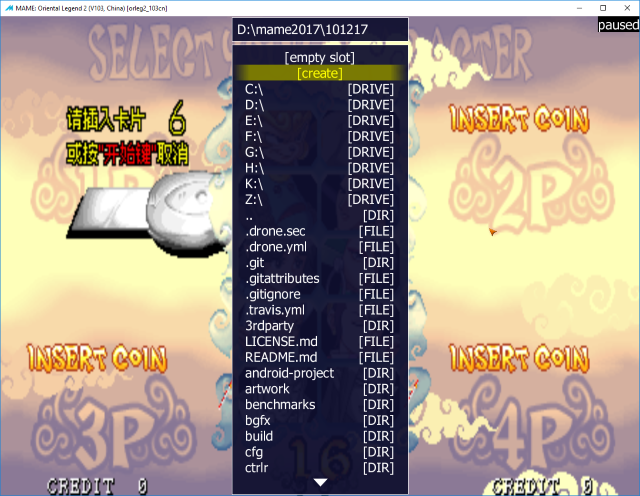 For the 0.193 release (or current GIT code) this is supported. 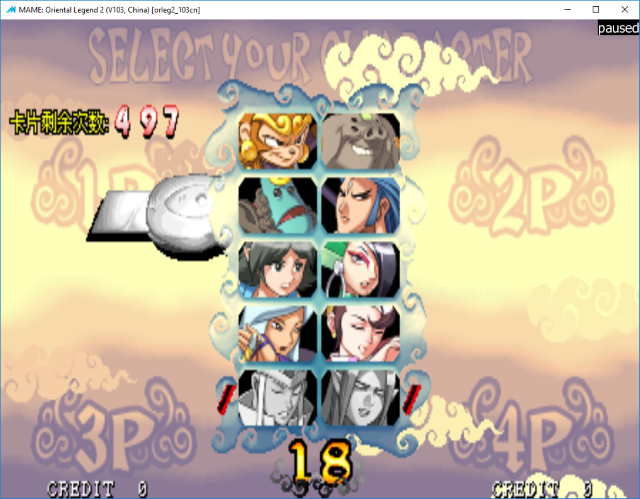 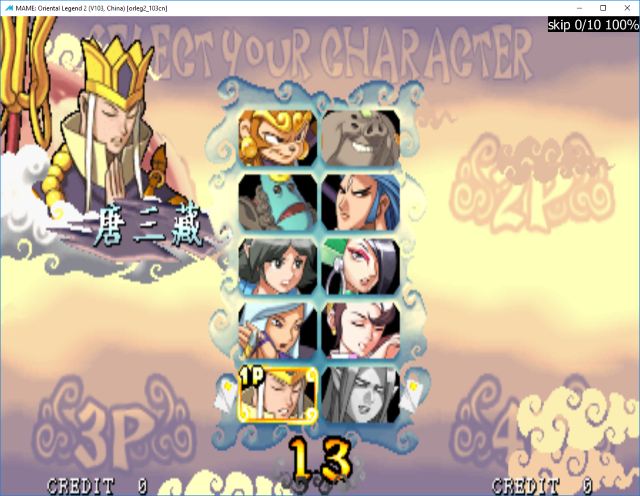 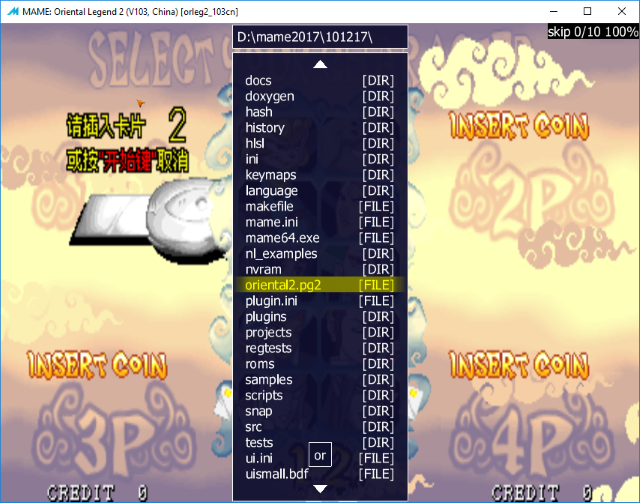 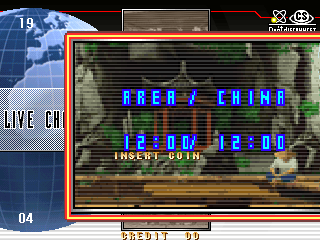 The English language version of Oriental Legend 2 does NOT have this feature (and the game is rebalanced to not require it) however the Chinese version does use it, so knowing how to use it in MAME makes sense. 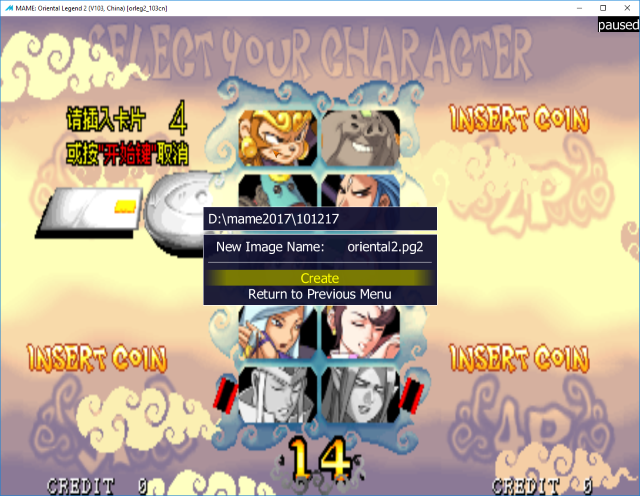 It’s worth noting that without a memory card the bottom 2 characters are locked,you can’t move the cursor over them without inserting a memory card. 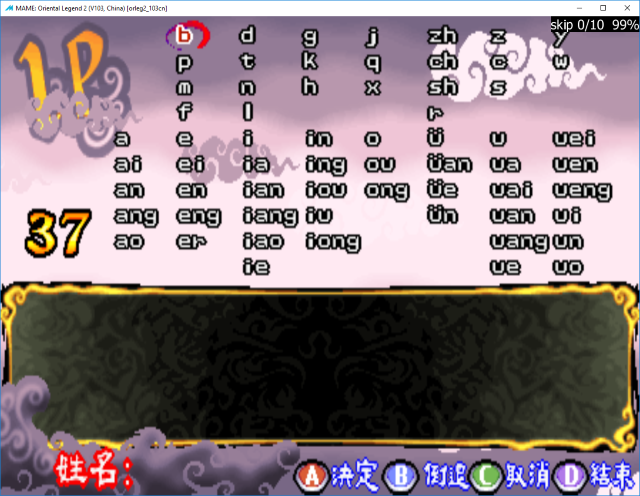 you can now enter a name, I’m not actually sure how this screen works as it’s all very Chinese. 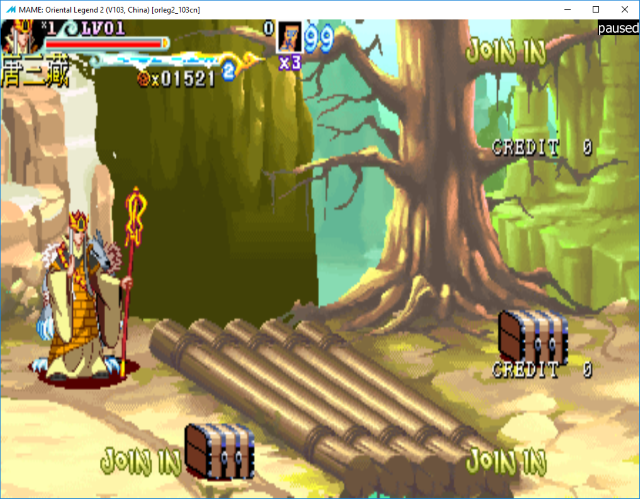 you’ll see that you start the game as level 0, with 1500 gold. 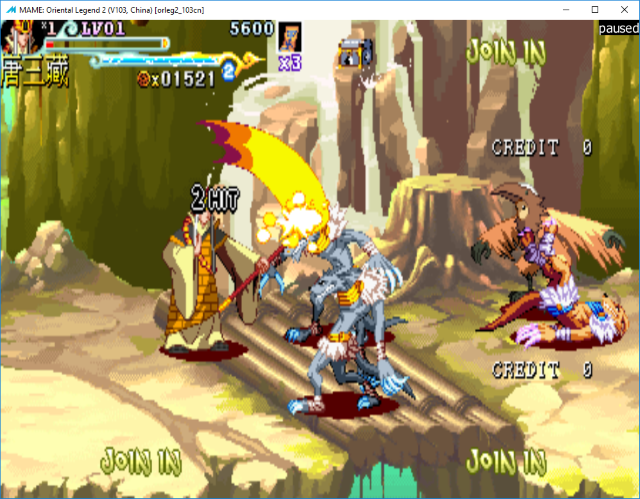 so play it a little bit, level up, collect some gold etc. 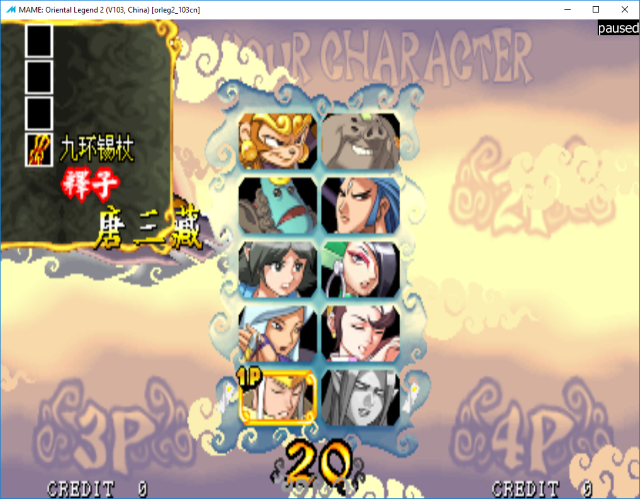 At this point (for the purpose of our testing) allow your character to die, so that you get the Game Over message (if your character doesn’t die no progress is saved) Take note, we’re a LV01 character (progressed from LV00) and have 1521 gold pieces. 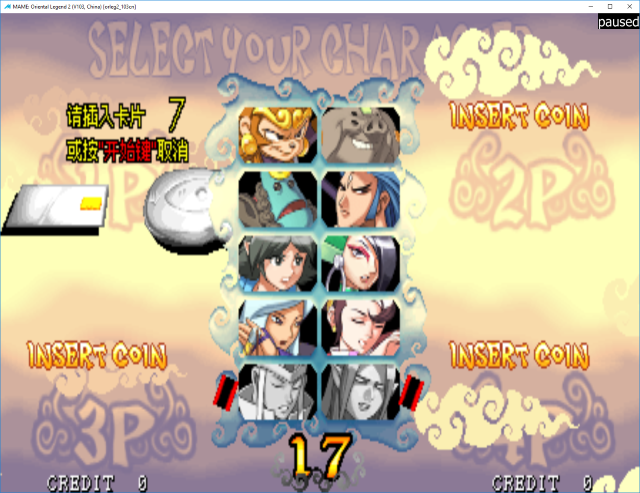 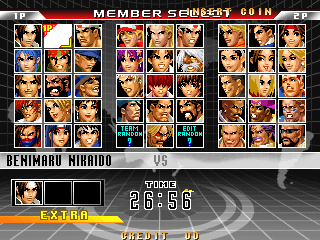 Quit MAME, reload MAME and get back to the character select screen. 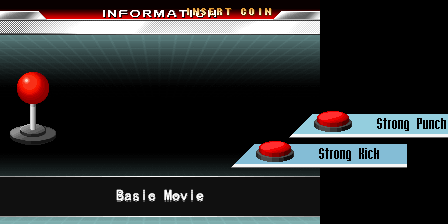 You’ll be prompted with the ‘insert card’ screen you saw before, again it makes sense to pause the game here. 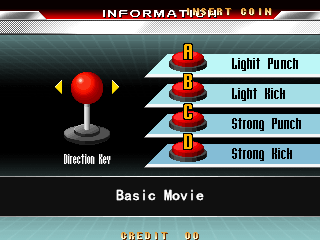 It will then show you equipment you have etc. 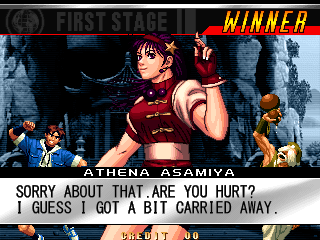 And then you’ll be back at the game. Note, the character is ‘LV01’ (not LV00) and has 1521 gold pieces, exactly as it was left when we killed the character off earlier. 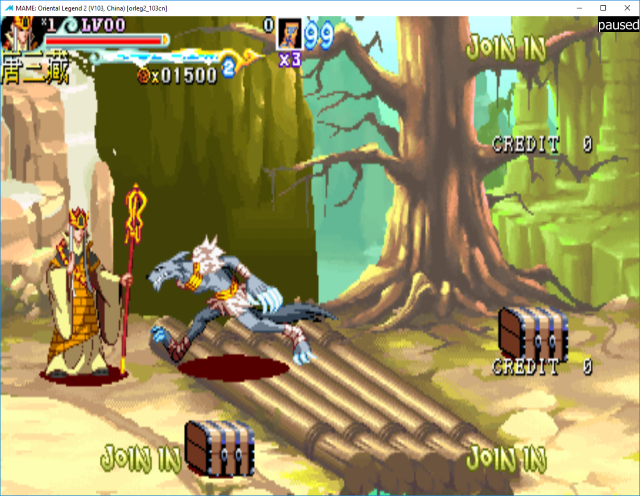 Knights of Valour 2 New Legend has a similar feature. 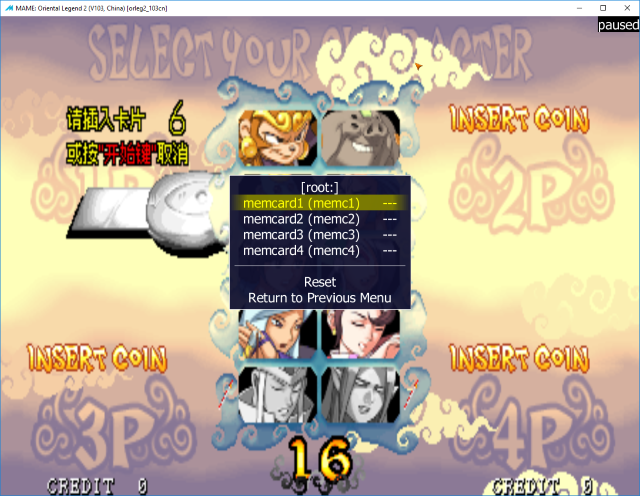 Note, the default (blank) cards have been added to the romsets, so you’ll need updated roms. 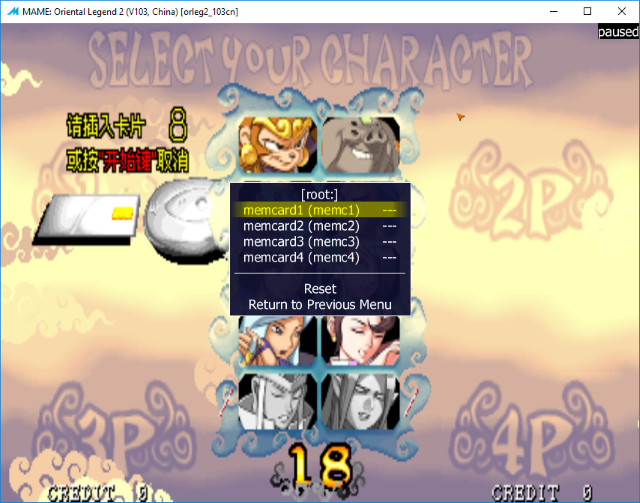 *edit* after some new information about the actual Card Reader came to light here are the new default card images, that include some additional ‘security data’ used as unlock passwords, current GIT requires these, old 256 byte memcard images are invalid. 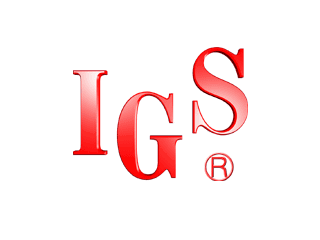 Thanks to MetalliC for reverse engineering and implementing the Card Reader MCU logic.